Time. The Fourth Dimension. The Universal Agent. Imagine having the power to control Time. To manipulate Time. To become its master. Instead of feeling like a slave to Time, imagine what you might do, if you had the power to make Time work for you? Men have always dreamed of possessing this power. In 15th century Italy, the discovery of mysterious ancient documents in Byzantium finally made it possible. Today, we often speak of the value of “our time”. We speak of “spending time”, and “buying time”. But in truth, it is not “our” time at all. Throughout the world, our Time is controlled, manipulated and directed, by ‘Masters of the Universe’. Men who are adepts in these ancient secrets, and have the power to make “our” Time work for them. They are the bookkeepers. The men who keep score. And just as it is said of the game of golf that “a good scorer can always beat a good player”, so it is with the mystical, magical art of double-entry bookkeeping. 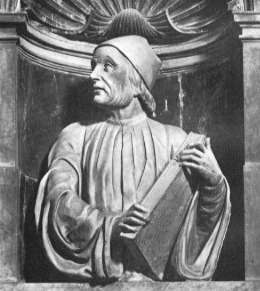 When the “Father of the Renaissance”, a humanist scholar, priest, and astrologer by the name of Marsilio Ficino translated the Corpus Hermeticum from Greek into Latin, he could not have known that his labour would, in time, condemn most of humanity to slave labour for the Lords of Time. 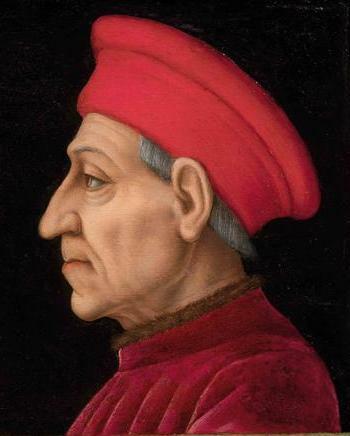 Ficino’s lifelong patron was Cosimo de Medici, scion of the famous Italian merchant banking dynasty, and ruler of the Florentine Republic. His circle of friends included the greatest philosophers, mathematicians, and elite movers-and-shakers in the Western world. They now had in their hands the ancient secrets of Hermes Trismegistus, the “Thrice-Greatest”. Now, it is well worth our time to pause for a moment in our journey through past time, to consider the identity of Hermes Trismegistus. Today, he is considered to be a syncretism of the Greek god Hermes, and the Egyptian god Thoth. The Greeks considered Hermes to be the god of boundaries and transitions – in particular, the transition to the after-life. He was also the god of commerce, travel, the patron of thieves and orators, and a cunning trickster who outwits other gods for his own satisfaction. The Greeks equated him with the Egyptian god Thoth, who shared similar attributes. Thoth was seen by the Egyptians as the god who maintained the universe, the mediator in disputes between good and evil. He was the god of equilibrium, who unified or balanced the opposites. Importantly, in both of their respective cultures, Hermes and Thoth were the gods of writing, and magic. The more astute reader, and in particular, the reader who has a grasp of the Duality Principle of double-entry bookkeeping — “for every credit there must be an equal debit” — may already be seeing a little light dawning in a corner of their mind. 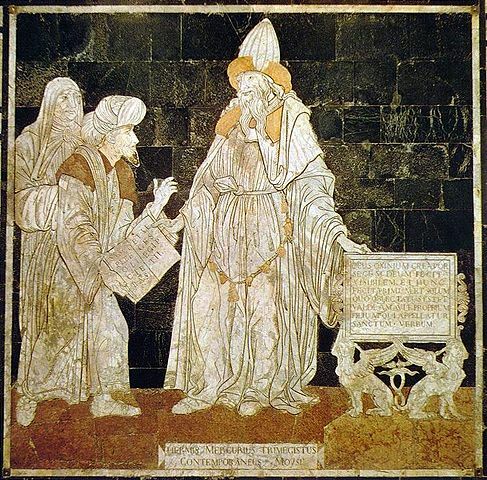 Ficino and his influential friends at the Medicean court were to discover in the Corpus Hermeticum and in Kabbalah Ma’asit (“practical Kabbalah”) the secrets to controlling Time, the Universal Agent. 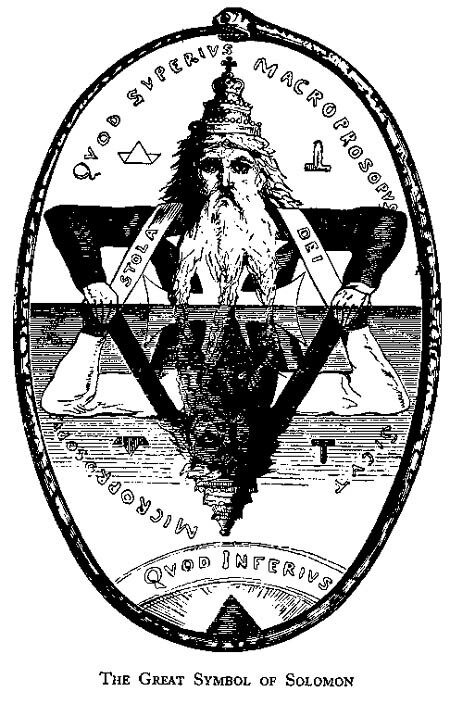 At the heart of Hermetic teachings was the idea that man could influence or even control the forces of nature. To do so, one needed to master the “Three Parts of the Wisdom of the Whole Universe”. One of these parts, along with Astrology and Theurgy, was the magical art of Alchemy. Similarly, at the heart of Kabbalistic theurgy was the idea that man could magically invoke the creative or Life force — using esoteric knowledge of divine language and writing — for personal advantage in this world. As with double-entry bookkeeping — and similarly, the dark art of keeping two sets of books — the magic of Alchemy involves a dual aspect or dual nature. In its esoteric (inner) doctrine, it is the work of spiritual purification; a transformation of common impure man, into pure and perfect Man. In its exoteric (outer) doctrine, it is the notion that man can transform common “impure” metals into pure gold, through the discovery and mastery of the “Universal Solvent”. 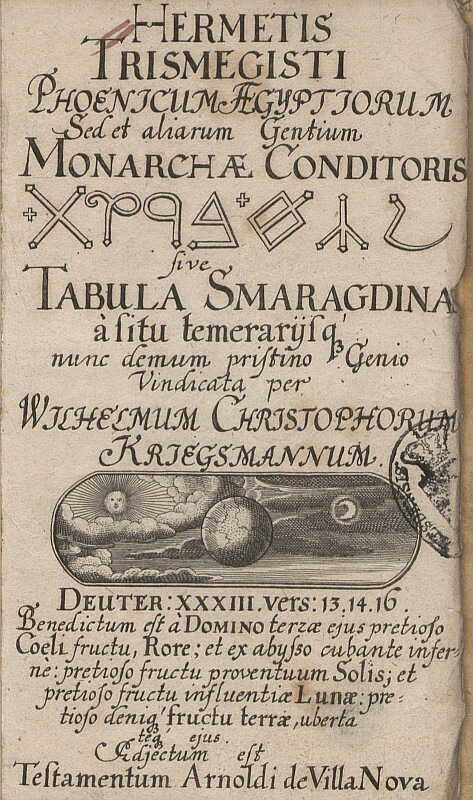 The magic of Hermeticism, with its emphasis on practical experimentation to discover and control the forces of nature, would have a powerful effect on the greatest scientific minds (such as Isaac Newton) for centuries to come. At the same time, its intrinsic get-rich-quick appeal would pose a constant attraction for over-indebted kings and princes — and for too-big-to-fail international bankers such as the Medici, whose compound interest-bearing loans the princes of Europe could not repay without borrowing even more. Some four hundred years later, a great revival of spiritualism and the magick arts swept over Europe during the late nineteenth through early twentieth centuries. 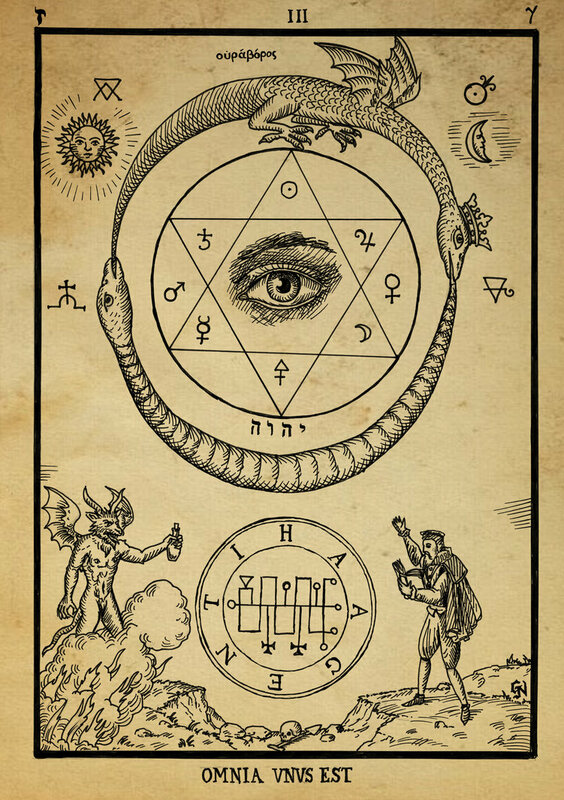 It is from this time, in the writings of adepts such as the famous occultists Aleister Crowley and Eliphas Lévi, that we can see clearly stated the most fundamental principles of Hermetic-Kabbalistic magick. As we will see, they are precisely the same principles that form the basic rules of double-entry bookkeeping. 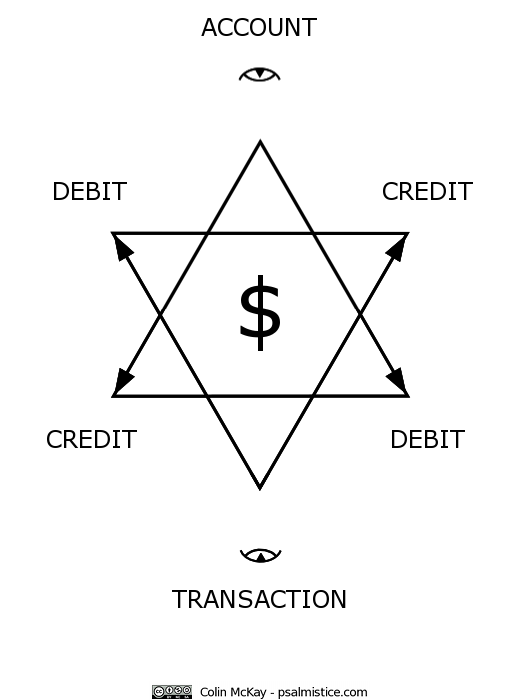 Hermetic-Kabbalistic magick has been carried down from the Hermetic Reformation of the 15th century to our time, deeply embedded at the very core of all economic and social life; in commerce, economic theory, the fundamentals of capitalism, and banking. 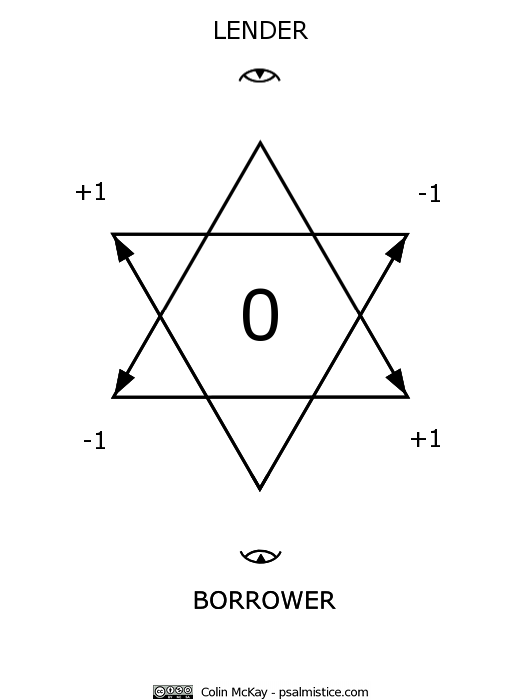 The Hermetic-Kabbalistic magick principle of double perception is embedded at the core of the money system itself. 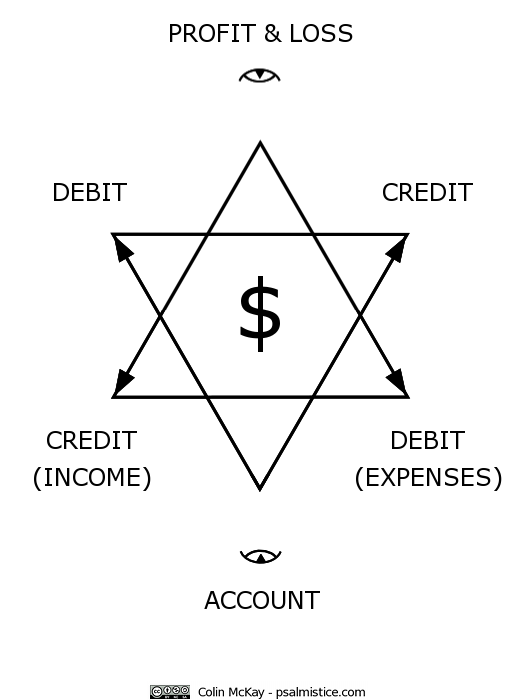 In the very act of ex nihilo (“out of nothing”) creation of “our” money in the form of loans — using nothing more “real” than electronic double-entry bookkeeping — bankers enjoy the power of creator gods, employing “divine” magick principles in writing and language to harness the force of Time, transforming it into wealth for themselves. “Money” created by bankers is simply the symbolic, written expression of this double perception. 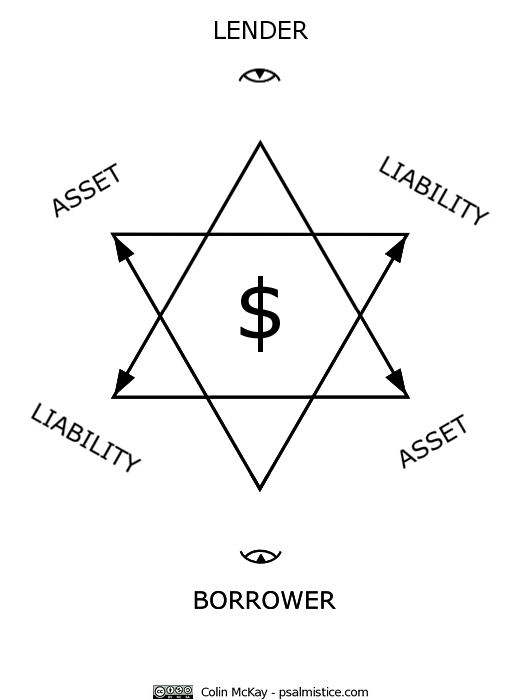 Each Dollar, Euro, or Pound created as a new loan magically appears (to the borrower) as both a debt (Liability) that must be repaid plus interest to the bank, and simultaneously, a credit (Asset) that the borrower can spend. 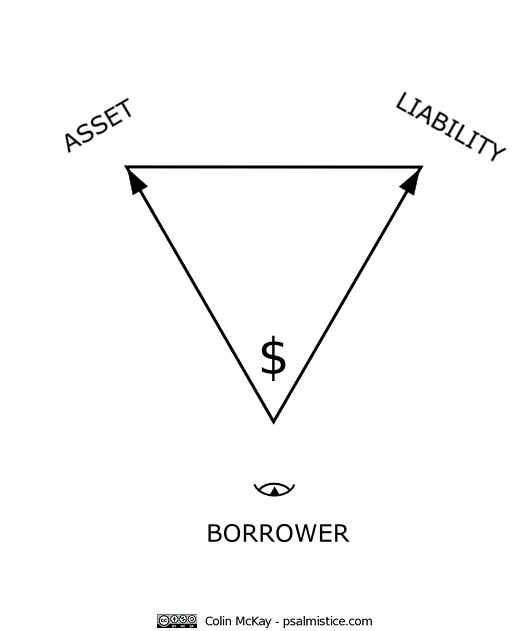 At the same time, to the bank that very same Dollar, Euro, or Pound magically appears as both an Asset (money that must be repaid by the borrower), and, a Liability too, because the bank must make it available to the borrower to spend. …the object of any magick ceremony is to unite the Macrocosm and the Microcosm. It is as in optics; the angles of incidence and reflection are equal. You must get your Macrocosm and Microcosm exactly balanced, vertically and horizontally, or the images will not coincide. …And however little he move to the right, let him balance it by an equivalent movement to the left; or if forwards, backwards; and let him correct each idea by implying the contradictory contained therein. …let him show the basis of that Stability to be constant change, just as the stability of a molecule is secured by the momentum of the swift atoms contained in it. In this way let every idea go forth as a triangle on the base of two opposites, making an apex transcending their contradiction in a higher harmony. Who can fail to see here, hidden in plain sight, the distilled essence, the Philosopher’s Stone, the whole alchemical formulation of double-entry bookkeeping? The adept takes every single “common” transaction, and on entering it into his books, he first dissolves it (SOLVE) into a pair of opposites (debit entry and credit entry). When it comes time to determine his Profits — and in turn, his total wealth or Capital — he “coagulates” (COAGULA) all of the entries in each of two columns (DR and CR) into a single number. This then, is the apex of the triangle, the “higher harmony” of the “base of two opposites”, “transcending their contradiction”. For the man who is greedy for gain, who sees financial wealth as the secret to a long and happy life, the possession of money is the means to attain “the full and entire conquest of his…future”. He can transform himself from a pauper into a prince — “the creation of man by himself” — and become a “self-made man”. Money is the means of controlling Time. By lending his money at compound interest, the skillful adept increases his wealth, without risking his health through manual labour. His little pile of wealth (“capital”) grows inexorably, compounding into an ever larger pile over time. Just as in Eisenheim’s great illusion of the Orange Tree, the “seed” which was taken by dividing a single orange into two equal parts, grows at a speed which defies Time, “producing” even more golden fruit – fruit that the magician assures us is “quite real”. This wondrous power is all thanks to the magic of what has been called “the greatest mathematical discovery of all time” and “the most powerful force in the universe” — compound interest. But in a classic example of circular reasoning, the alchemical wizard’s “right” to charge compound interest is all thanks to a cunning rhetorical device (remember, Hermes was the god of oratory) — the so-called “Time value” of money. This clever sophistry of the “Time value of money” has its origin in one of the greatest moral arguments of all time; whether the charging of interest on money (usury) is right, or wrong. If you are a businessman concerned with the morality of making a profit, then keeping the fullest possible set of accounts is a bit like confessing your sins. Indeed exactly because accountancy looks like a dry, value-free activity, it can be used as a kind of moral laundry. When the Nazis stole the personal property of Europe’s Jews, Himmler insisted that all the looted property be meticulously accounted for. 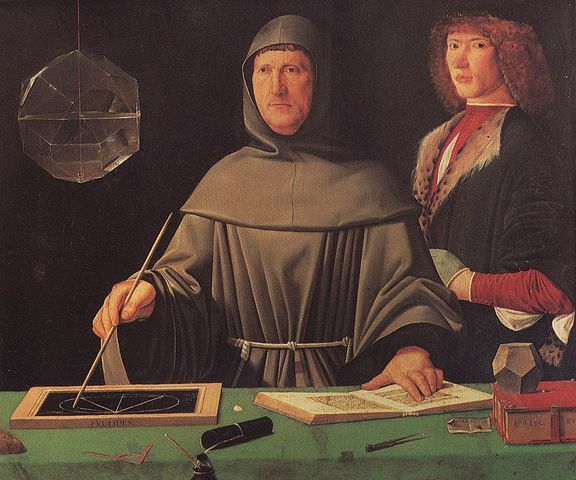 The popularisation of double-entry bookkeeping in the Medici’s time offered another profoundly important benefit. It gave the merchant a way to “rationally” justify all of his “costs” — including the “costs” he perceives himself to have suffered, in extending (lending) “credit” to customers. 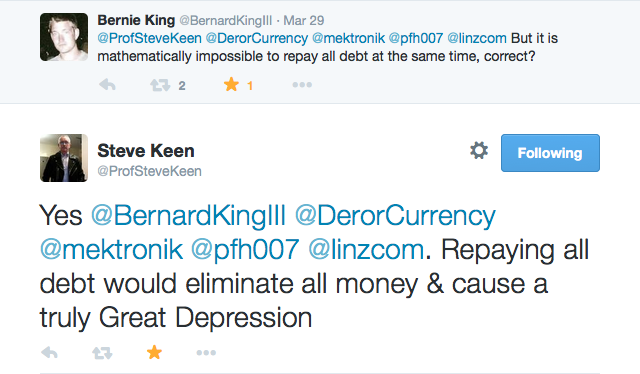 This would prove crucial in context of the historical argument on usury. Then, as now, those who argued in favour of usury have claimed that a man who lends his money to another has a moral right to be compensated for a wholly imaginary expense — the “opportunity cost” of his not being able to use the money he loaned out, to earn more money in some other way. The “logic” of this argument for charging interest rests on an arrogant presumption — that the lender is certain of earning a “return” in that “other way”, and therefore, he must certainly be suffering a “cost” of lost “opportunity” to “earn”, if he lends his money out instead. The unstated notion here, of course, is that, one way or another, the owner of money must always receive even more money. Gimme gimme gimme, more more moar! It is on the foundation of this sophistry of an imaginary “opportunity cost” suffered by the money-lender — and “proven” to be real simply by writing it into his double-entry accounting books — that an even greater sophistry is built — that of the Time Value of Money. In an essay published in 1985, the historian James Aho linked double-entry bookkeeping to the ancient art of rhetoric, the rules used to make persuasive arguments perfected by the Roman lawyer and orator Cicero (an art, incidentally, which Aristotle says sprang from a property dispute). According to this argument, medieval merchants used double-entry bookkeeping as a rhetorical tool of capitalist propaganda, to persuade their ‘audience’ that their business was honest, morally sound and its profit-making justified. Today, we are born into a world where the “logic” that money possesses a Time Value seems self-evident. The idea is so deeply embedded in our individual and collective consciousness, it has become part of our common language. Everyone knows that “Time is Money”. This belief that money has an intrinsic Time Value is, however, nothing more than a spectacularly sly, self-serving example of self-interested swindlers successfully selling a self-referential, “self-creating” sophistry. For over 500 years, its purpose has been to persuade us all that money will certainly earn more money over time; and therefore, money possesses the innate power to earn more money over time; and therefore, the Lords of Time must have the right to charge interest for the use of money lent out, as compensation for their “lost opportunity” (ie, Time) to “earn” more money from their money’s innate power to earn more money. This first half of the “Time Value of money” circular flow of illogical reasoning has come to be universally accepted, largely because so few pause to consider the unstated second half of the circle, which goes like this: and therefore, the Lords of Time must also have the right to pay interest (if they wish) to people who deposit money with them for “safe-keeping” (storage), as compensation for their “lost opportunity” to “earn” more money from money’s innate power to earn more money — err, say what now?! — (and whose deposits the Lords of Time can also lend out and charge interest for); and therefore, since it is now firmly established that money deposited with the Lords of Time will earn interest over time, this proves that money will certainly earn more money over time, and therefore money obviously possesses the innate power to earn more money over Time, etc etc, ad infinitum. The idea that money available at the present time is worth more than the same amount in the future due to its potential earning capacity. This core principle of finance holds that, provided money can earn interest, any amount of money is worth more the sooner it is received. Clearly then, the circular logic of the supposed Time Value of Money fails, if ever the “universal fact” that “money deposited in a savings account will earn interest” fails. At this present time, so-called “ZIRP” (Zero Interest Rate Policy) and even “NIRP” (Negative Interest Rate Policy) is spreading all over the moribund economies of the Western world. We now receive zero interest on money deposited in a savings account. Not only that, in an increasing number of Western countries, the Lords of Time are now charging interest (ie, paying negative interest) on money deposited in a savings account. Yes, that’s right … if not now, then very soon, they will charge you interest for “holding” money on deposit in the “safe-keeping” of their bank. Why are they doing this? As with so many magician’s tricks, the key to successfully pulling off the illusion, is movement. 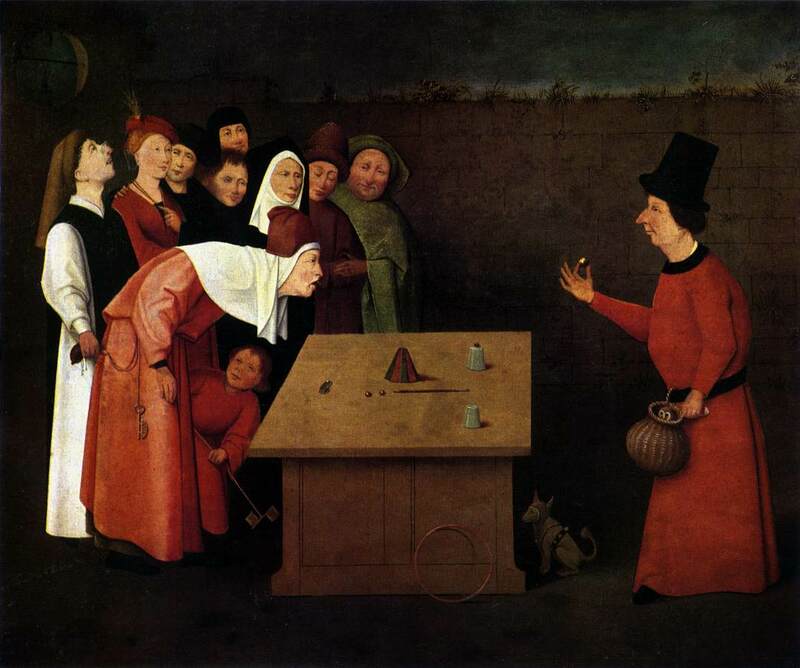 In the sideshow hustler’s game of Thimblerig or Three Shells and a Pea28, the faster the hustler moves his hands, the more difficult it is to see that he has moved or even pocketed the pea. In the great alchemical trick of Hermes the Thrice-Greatest and his Latter-Day Saints, this vital movement is called “Flow”, or the “Velocity of the Circulation of Money”. So long as the flow of money in the economy is fast enough, no one notices that the game is actually rigged. That is, no one notices that there is insufficient money in the system to pay interest. This policy of zero (or even negative) interest rates on bank deposits, is all about trying to speed up the flow of money in the economy. The Lords of Time are hoping that this policy will encourage people to spend (“Flow”), not save (“Stock-pile”) money. Why? Because the only way for the Lords of Time to keep on “earning” compound interest on the intergalactic levels of debt that they have lent to the world, is to make the “money” flow fast enough. The real truth of the Money Illusion is this: If everyone had to settle their debts at the same time, there is always far more money owed, than there is money to pay with. The game only seems to work fairly and honestly if we only look under one shell at any time, and, if we believe the hustler’s claim that the missing pea really is just hiding under one of the other shells all the time. In a recent article in Forbes titled “The Principal And Interest On Debt Myth”,29 a modern day mathematician and globally renowned academic economist set out to prove to the now-growing crowd of questioning (and in some cases, hostile) finger-pointers, that we should all just “Move along now, there’s nothing to see here”. That is to say, he challenged the view that “because banks lend principal, but insist that principal and interest be paid by the debtor, the money supply has to grow continuously to make this possible”. Alas, the accounting fraud-riddled history of double-entry bookkeeping ever since its Western popularisation by Fra Luca Pacioli (and more importantly, by his powerful patrons in the world of money-lending), strongly suggests that a reliance on the “logic” of double entry to “prove” anything with regard to banking, money, debt, and compounding interest, is tantamount to using the casino’s own roulette wheel in an attempt to “prove” that the game of roulette is not rigged in favour of the house. Or, to return to our shell game analogy, it is tantamount to relying on a sideshow hustler’s own sleight of hand skills to “prove” that the pea you couldn’t see really was under one of those three shells all the time. It all works fine (for the hustler), whilst ever the “flow” of the hustler’s hands is fast enough to fool the common man. But if the flow is slowed – in economic terms, by a growing “loss of confidence” in the game, resulting in too many people saving or “hoarding” money (Stability) rather than spending it (Movement) — suddenly the hustle begins to be exposed. At a slower rate of “flow”, it becomes much more easy to see that the hustler has been pocketing the pea all along. In his zeal to disprove the claims of a growing crowd of questioning onlookers who are pointing out that the monetary alchemists’ shell game is rigged, the good professor has fallen afoul of the error of oversimplification. 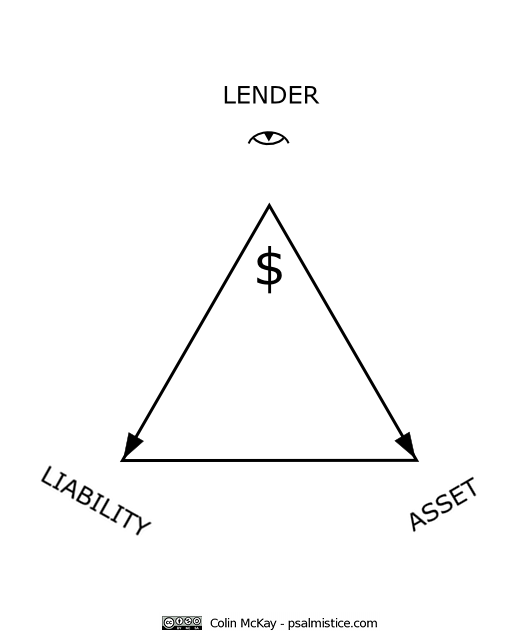 A simple double-entry bookkeeping model, of a “simplest possible financial system”, having a limited set of parameters, that obviously does not include all the parameters of the real world’s financial system, but that does include a number of invalid assumptions (eg, the notion that banks are “consumers”, who spend all their earnings back into the “flow” of the national economy); a model that does not reflect the real world “which is far more complicated”, is a model that is quite obviously too simple, and does not prove (or disprove) anything at all. Some five hundred people came to hear the celebrated mathematician speak … The famous Venetian printer Aldus Manutius was there and may have brought along Erasmus, who was staying with him near the Rialto while supervising the printing of his translation of Euripedes and a collection of ancient proverbs. Bernard Lietaer is a former central banker, fund manager, and co-designer of the European Currency Unit (precursor to the Euro), who was named “the world’s top currency trader” by Businessweek in 1992. Today, Lietaer is a currency system reformer with almost 40 years active experience in the field. In Rethinking Money, he uses the brilliant analogy of the game of musical chairs, to help explain how “our” alchemical money system really works. Unlike these present-day Lords of Time and their legions of high priests all preaching the obscure doctrines of Hermetic-Kabbalistic economic theology, Lietaer is speaking an everyday, “common” language — of “common” imagery and symbols — that we can easily understand. Most important to notice though, is that his clear and simple language is a result of his motivation. He seeks not to obfuscate but to elucidate. Added Faivre quotation, footnote 31.